Many think if you have tooth abscess, infection, you must have pain. This is not always the case since abcessed teeth can sometimes be dead and will not trigger our pain response. I tried to find the best way to explain what tooth abscess really is, but when there are already many reviewed articles published on sites trusted such as nih.gov, I probably would come short with words in comparison. So I take the liberty of posting this wonderful reviewed article that explains what tooth abscess is. Please ask your questions by going to info@918dentist.com or simply click on comment section below. Last reviewed: February 22, 2012. A tooth abscess is a collection of infected material (pus) due to a bacterial infection in the center of a tooth. The dentist will closely look at your teeth, mouth, and gums. You may have pain when the dentist taps the tooth. Biting or closing the mouth tightly also increases the pain. 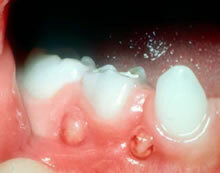 The gums may be swollen and red and may drain thick material. Dental x-rays and other tests can help your dentist determine which tooth or teeth is causing the problem. Reviewed by: Paul Fotek, DMD, Florida Institute for Periodontics & Dental lmplants, West Palm Beach, FL. Review provided by VeriMed Healthcare Network. Also reviewed by David Zieve, MD, MHA, Medical Director, A.D.A.M. Health Solutions, Ebix, Inc. Comments Off on What is tooth abscess?